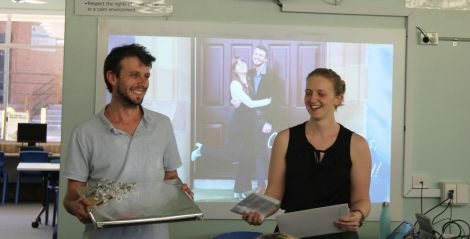 Shane receiving the gift at his school. 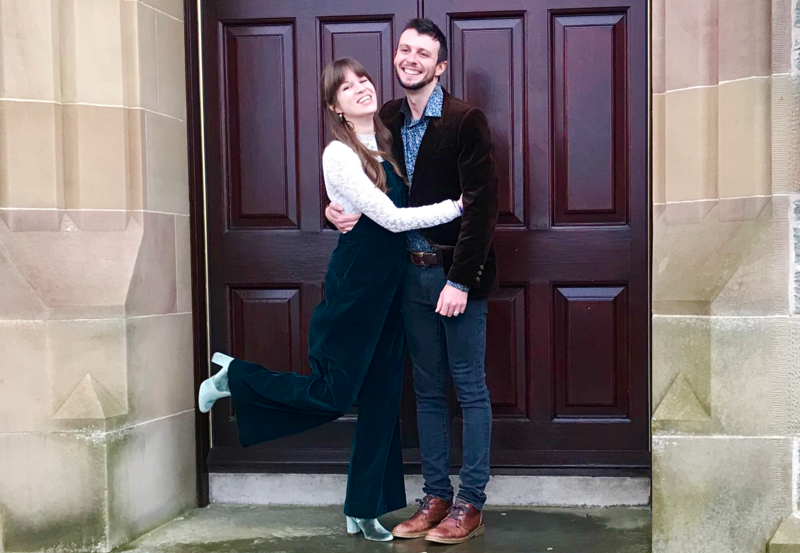 A SHETLAND painting has travelled across the world as a wedding gift for an Australian couple who spontaneously tied the knot in Lerwick earlier this year. Brigid Krause and Shane Eaton wed in January at Lerwick Town Hall after deciding on a whim to get married on a family holiday to the UK. “We only told my mum the night before,” Brigid said to Shetland News shortly after the big day. Brigid and Shane on the steps of Lerwick Town Hall. While it appears Shetland will always have a place in the couple’s hearts, it looks set to have a place on their wall too. A painting by local artist Ruth Brownlee was bought by colleagues of teacher Shane as a wedding gift – with the piece of art ending up being taken in a suitcase thousands of miles across the world. His colleagues first got in touch with the Yell based Shetland Gallery, which suggested a few paintings of Shetland they could buy. The gallery’s Alan and Shona Skinner were incidentally about to head out to Australia to visit family in Manly, so they offered to take it in their case. “To cut a long story short, a few weeks later, we delivered the painting to one of Shane’s colleagues in Sydney – via Aberdeen, London, Tokyo, Osaka, Tokyo and Sydney,” Alan said. The painting was then handed over to Shane in a ceremony at his school.